When you say “maintenance free battery” does it really mean that you really do not do anything and just let the battery run its course until it dies out? The life of a battery depends a lot on how you use it and maintain it. So how do you really maintain a marine battery to extend its life? Factors which contribute to how a battery performs include charging, temperature, use and maintenance. You do not have much control over all other factors except for maintenance. So to keep your battery from dying out on you in the middle of the sea here are some useful tips as to how you can properly take care of your marine battery. Clean accumulated dirt – Most battery storages in boats are hard to reach and because of this the tendency is to forget about them. Through the course of time it will accumulate dirt and the only thing that you can do to remove it is clean the surface. Clean the top of the battery which includes removing corrosions on the terminals. 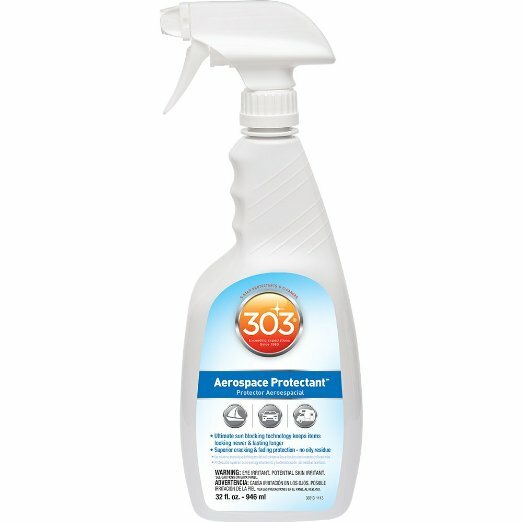 You can use a clean cloth to remove dirt from the surface of the battery and you can use a steel brush or a terminal cleaner to remove corrosion. Even if your battery is maintenance free, you still have to do a little bit of cleaning. Charge your battery properly – Charging your battery can be a tricky thing to do. Different kinds of batteries have different charging times. Aside from that you also have different amped chargers (either fast charge or slow charge) which you can use, so this adds to how to properly charge your marine batteries. We will talk more about how to charge different types of batteries in a later section of this article but it all boils down to not overcharging your batteries. For flooded deep cycle batteries, do a periodic check on the water level. Batteries that need distilled water have a maximum and minimum indicator for you to follow so make sure you fill each panel with ample amount of water. Never add mineral water because it will destroy your battery. Charging a deep cycle battery should be done as how the manual says it to be charged. Primarily cycling the battery lightly for the first few charges so that it can help in completing the forming of the plates. After every charge, make sure to allow the battery to cool off. The cooling time is very important for you to maximize the performance of the battery. If you do not cool off the battery, heat will grow and it will accelerate the accumulation of corrosion which can lead to battery failure. It is never advisable to quick charge in between uses. This will shorten the battery life. Yes, the cycles are shallower but the cooling time is eliminated therefore shortening the life of the battery. Never charge a wet battery with an incompatible charger. In the same case, never charge a gel cell battery with a wet battery charger. 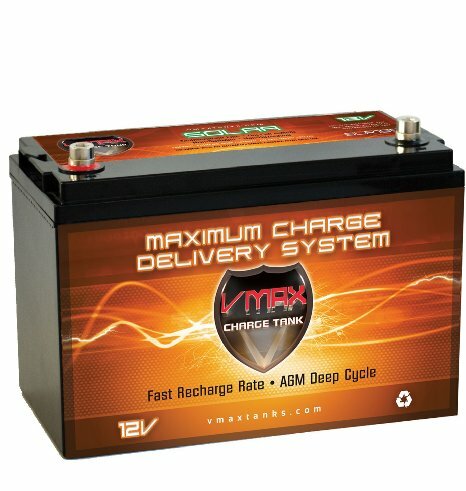 Although either charger can charge your deep cycle marine battery this charging technique will never give back the 100% capability of the battery because of sulfation. Deep cycle batteries need to be periodically equalized to help the cells keep its balance. It is recommended to equalize actively used batteries once a week. You can use either manually timed chargers or automatically controlled chargers, such as the Schumacher Battery Charger shown above..
An inactive battery should be given a boost charge after being stored for the winter or not used for a long time. Batteries have a tendency to discharge even if they are not used. 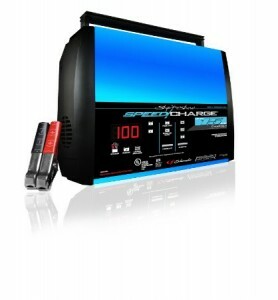 AGM batteries can be charged with conventional chargers and has a self protection technology that reduces overcharging. 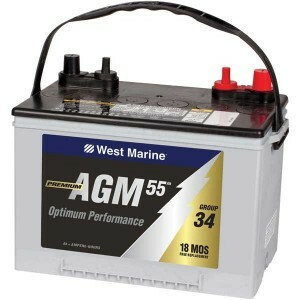 As compared to lead acid batteries, AGM batteries have a lower discharge rate which is better for marine use. This is practically a no or low maintenance battery. But even if you can use any particular charger for this type of battery, you should use a preferred charger because this is more expensive [battery] than the ordinary type lead acid battery. 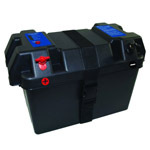 AGM batteries can be charged to a 2.4volts/cell without any problem. You have to reduce the float charge to about 2.25 – 2.3 v/cell. It charges faster and stands well in cold temperature. When charging an AGM battery make sure that you charge in a well ventilated area because gas might be released from the pressure valve if the battery is overcharged. If the battery is frozen because of the winter season, never charge it. Some chargers have an AGM setting and if set properly there really is no charging time limit and you rarely will overcharge your batteries. Constant current chargers can also be used for this kind of battery but the maximum number of charging hours is up to 16 hours only. What is a Marine Battery Isolator? 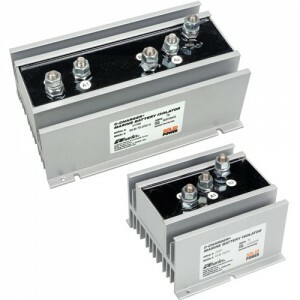 When multiple batteries in a system are charged, you need a marine battery isolator. 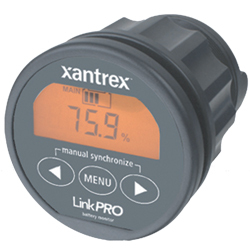 A marine battery isolator functions as an automatic switch to isolate current and let you charge 2 batteries. This is usually used for boats which have a starting battery and a deep cycle battery. When installed in a boat it functions as a switch that allows one battery for engine use and another battery for cabin and other electrical use for the boat. These types of chargers come in a variety of models which are usually waterproof and vibration proof. When you use a marine battery charger to power up your AGM or lead acid battery or starting battery make sure that you switch the knob to the proper setting. Do not use a 24 volt or a 36 volt output charger for your marine batteries. They will shorten the battery life. It is best to use 4 -6 amp battery chargers or even up to 15 amp multibank chargers so as to maximize the performance of your battery. 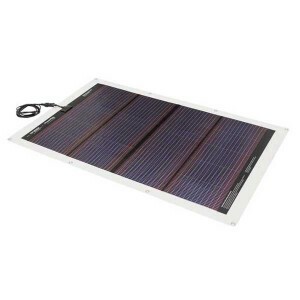 Is a Solar Marine Battery Charges a Myth? Why is a boat the best way to keep the battery fresh? Often times people forget to store their marine batteries for the winter or forget to take out the batteries from the boat during winter time, but the boat is actually the perfect place to keep your batteries fresh even during the winter season. Keeping your batteries in your boat and occasionally starting the engine of your boat during the winter season is actually a great way to keep your batteries fresh and not to discharge during the cold season. Just make sure that you have properly cleaned, installed and checked your battery before the winter season starts.